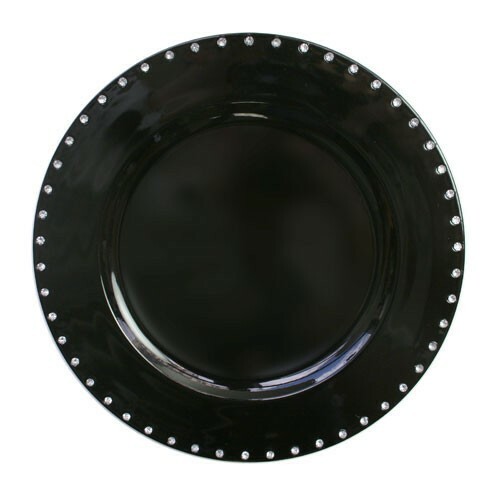 ChargeIt by Jay Black Jewels Rim Charger Plate 13"
Home > Products > ChargeIt by Jay Black Jewels Rim Charger Plate 13"
Make a striking impression at weddings, formal receptions, and upscale dining by serving multi-course meals on the ChargeIt by Jay Black Jewels Rim Charger Plate 13". Adding an edgy yet sophisticated touch to any setting, this product features a jeweled border that stands out against the all-black background. Made from high quality polypropylene, this decorative piece combines style and exceptional durability. Thanks to its 13" diameter surface, this charger beautifully frames dinnerware and protects tabletops against spills and mess. Hand washing is recommended to properly clean and maintain this charger plate.